CBS Minnesota Local WCCO reports that United States Marine Woody Williams will be representing a group of 15 Medal of Honor recipients at tonight’s Super Bowl LII between the New England Patriots and Philadephia Eagles. Williams, aged 94 years-old, will do the official coin toss to determine who starts the game with the ball. Williams said he hopes that the coin toss and the game will in some way unite the nation to “respect our country” and the flag. "It's so far-fetched and such a tremendous honor to be the 52nd person to flip that," he told media. "I hope I'm serving a purpose and to influence and encourage people to serve each other." “I hope we can maybe raise the bar a little bit of how important it is that we respect our country, that we respect our flag, that we remember and respect and pay tribute and honor to those who never got to come home,” he added. 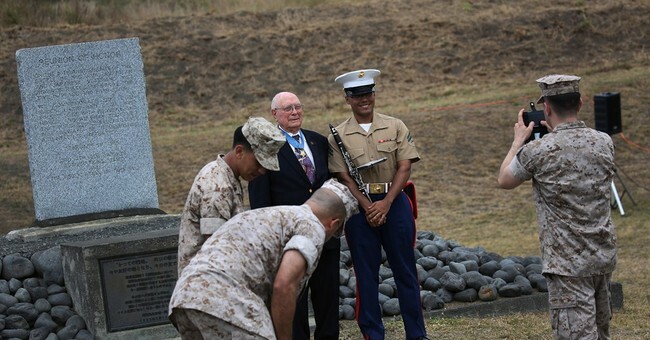 Williams is the only living Marine Medal of Honor recipient from World War II. He served in Iwo Jima and his bravery earned him the prestigious recognition. But, he retains a humble love of his country, saying, ""I was only doing what was expected of me." The veteran was there when "old glory" was finally planted in the ground. "All of a sudden there's Old Glory and it lifted the spirits of everybody," he said. "We became more determined than ever we would win this thing." Williams recently had a book written about his life. The book, Flame Thrower, tells the story how Williams "enlisted in the United States Marine Corps and fought in the battles of Guam and Iwo Jima with the 21st Marine Regiment, 3rd Marine Division. In July 1944, he survived one of the largest Banzai attacks the Japanese would conduct against Marines fighting against the fanatical and ruthless forces of the Imperial Japanese Army. During the battle for Iwo Jima in February 1945, Woody displayed “valiant devotion to duty” and service above self as he “enabled his company to reach its objective. In a four hour engagement, he took out seven pillboxes and killed 50 Japanese with a flamethrower breaking through a line of defense that had held up hundreds of Marines for days. Woody's actions, commitment to his fellow service members, and heroism were recognized on October 5, 1945, when he received the Congressional Medal of Honor from President Truman at the White House." Williams will be joined by the 14 other Medal of Honor recipients on the field.